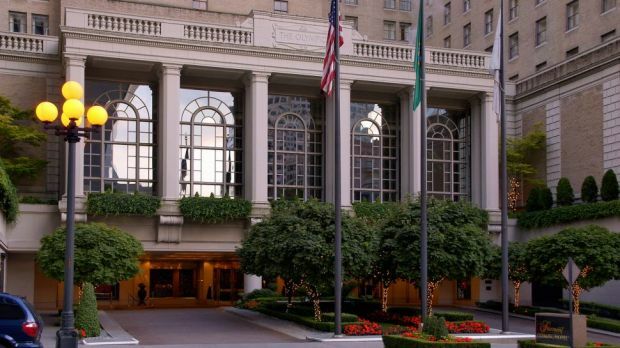 The Fairmont Olympic Hotel is located in downtown Seattle, approximately 45 minutes from the Sea-Tac International Airport, depending on traffic. The Italian Renaissance architecture of The Fairmont Olympic Hotel brings European style to Seattle visitors. The luxuriously decorated rooms, featuring burnished woods, ornate fabrics, and cushy beds convey pure Continental elegance. Discover French-inspired Northwest cuisine at The Georgian, adorned with Palladian windows and enormous chandeliers. And at Shuckers, Seattle's oldest oyster bar, sample 13 kinds of oysters prepared nine different ways, as well as local beers only available in this region. With an historical ballroom, featuring a vast foyer, and truly amazing chandeliers, the Fairmont is host to many prestigious events and occasions. And being in the heart of Seattle, you're close to all the famous attractions, including Pike Place Market and the Space Needle. Send an availability request with your requested dates to the Fairmont Olympic Hotel.